The New Year has just barely begun. As we get older, we may feel a bit like King Solomon, penning his “everything is meaningless” tirade, as we too know how rare a new year has made anything new in our lives. You might be lamenting more than resolving, as you get settled into this new year on the calendar. Jeremiah, certainly knew what it was to lament (Lamentations 3:19-24), as the presumed author of the book of Lamentations. He did not spare a thought, when he cried out to God, for the sorrows in his life. Jeremiah was not speaking from his most recent experience, as his words previously, and following, indicate that he had not awakened to relief from what was agonizing to him in a very long time. His words were born out of commitment, out of trust in a god who saves. Can we speak such words? Even if it seems that God is silent? Even if it seems that He is not listening to our lament? Can we enter this new year with conviction that “the Lord is my portion”? Or, to rephrase it, the Lord is enough. Is the Lord enough for you? If He is all there is, is He enough to sustain you? If we can enter 2015, able to say with our mouth, our mind and our heart, that God is enough, and resolve to live it as true, then maybe we can come to the end of this year with King Solomon’s meaningless tirade, far from our own experience. Maybe we can end 2015 saying there is meaning in life. 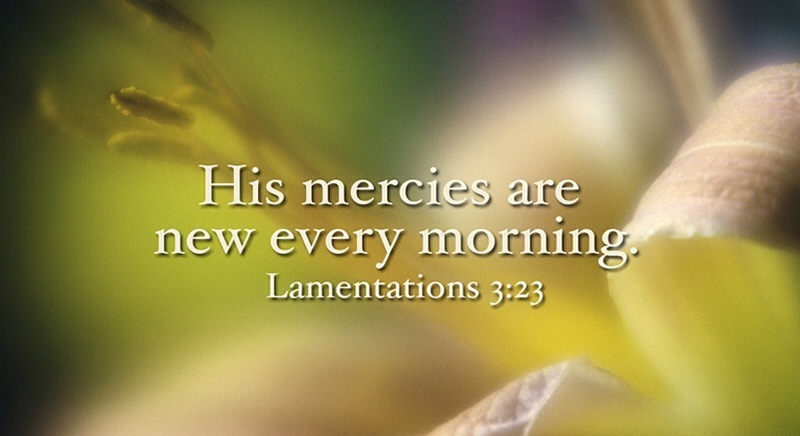 And we don’t have to bite the whole year off at once, for His mercies are new every morning.